Black chicken soup is widely revered as the King of all Chinese soups. 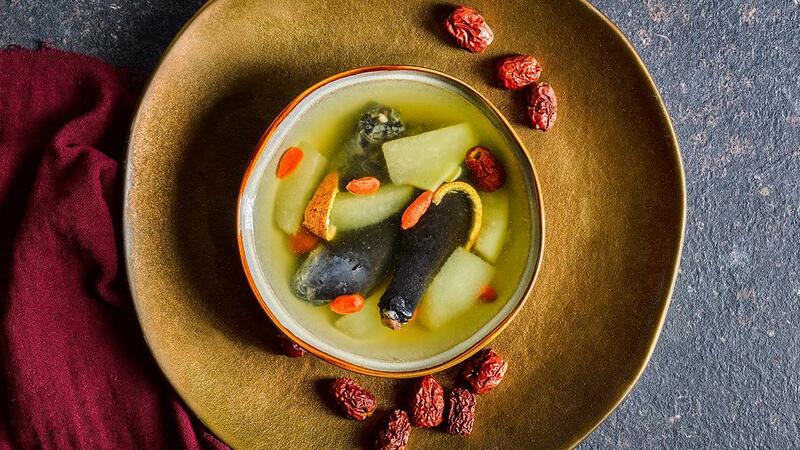 Enjoy this delicious bowl of nourishing goodness that marries the delicate flavour of black chicken with the crispy touch of snow pears and almonds, all immersed in a superior stock. Clean black chicken, cut into large pieces, quick blanch in hot water for 5mins. Rinse off excess blood, set aside. Peel off snow pear skin, de-seed and cut into large pieces. Set aside. Soak sweet and bitter almonds in water. Slice old ginger and cut orange peels into smaller pieces. Heat up 3L of water in wok, season with Basic Stock Reduction, Chicken Seasoning Powder and salt. Bring stock base to a simmer. Add in all soup ingredients to stock base. Simmer soup for 1 hour on low heat. Pour Chinese hua tiao wine to soup.